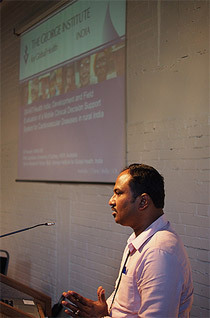 Praveen Devarsetty, Senior Research Fellow at The George Institute, India, and a doctoral student at the University of Sydney, has been awarded the best paper on mobile health at the 2013 Medicine 2.0 conference in London. Praveen presented the development and evaluation of an electronic clinical decision support system in rural India which is a feasibility and preliminary effectiveness study for SMART Health India. To qualify for the award, the submitted abstract had to demonstrate the use of mobile or wireless technology in the diagnosis and treatment of disease, healthcare professional communication coordination or clinician-directed wellness behaviour modification. iMedicalApps and Medicine 2.0 congress sponsored the award for the best paper on mobile health presented at the conference. The winning paper was chosen by iMedicalApps editors, JMIR editor-in-chief and selected members of the Medicine 2.0 Scientific Program Committee. Medicine 2.0 is the leading academic conference series for Internet, social media and mobile apps in health. The 2013 event took place on 23 – 24 September 2013 in London and was attended by over 500 participants and featured 450 presentations and 170 posters.